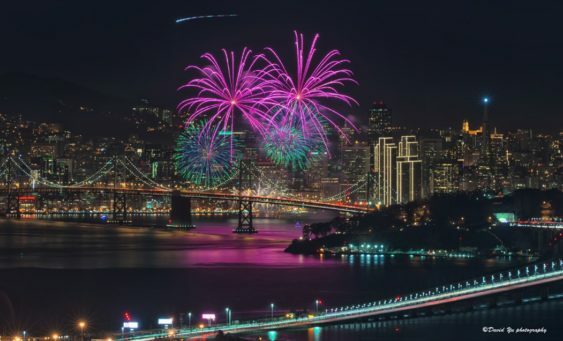 Say goodbye to 2018 and ring in the 2019 new year with 200,000 fellow bundled-up San Franciscans for an annual tradition as the city once again hosts a free waterfront midnight fireworks show on New Year’s Eve. Arrive by 11:30 pm and head south of the Ferry Building along the Embarcadero for the best view. Fireworks kick off right at the stroke of midnight. The fireworks typically launch from barges located 1,000 feet out in the bay, just south of the Ferry Building near Pier 14 (Mission Street and The Embarcadero), so the best viewing spots will be south of the Ferry Building along the Embarcadero between Mission and Folsom Street. Please note that standing in front of the Ferry Building will not be a good place to view the fireworks. It’s way too crowded and your view can be blocked by the Ferry Building. Typically, there’s a 15 minute midnight fireworks show. Each year, they unveil a few new and interesting pyrotechnics. The fireworks are usually synced to music, played out through speakers that are set up along the promenade stretching from Pier 14 down almost to the Bay Bridge. So although there’s no radio simulcast and no live entertainment, if you’re close to Pier 14, you should be able to hear the music just fine. Assuming the weather is good here are some other great locations to view the fireworks. Visit bayarea.com/play/fireworks-bay-area/ for photos and further detail. As long as you can arrive early, you might squeeze in for an amazing shot from Yerba Buena Island looking towards the SF skyline with the Bay Bridge below you. Just be wary of the steep drop from the cliffs below. Or for a more grounded shot (without peering down on top of the Bay Bridge), you can head down to the flatlands of Treasure Island. Please note that in the interest of public safety, the city highly discourages people from visiting Treasure Island for the fireworks. Traffic and parking may be restricted. It’s residential and there’s not much space, but two places with amazing views are the end of Alta Street (just off of Montgomery) and the end of Calhoun Terrace (just off of Union). Just keep in mind that it can get crowded. Please be very respectful of the neighbors and pack all your trash and take it with you. Marin Headlands – You can typically see the tops of the fireworks over downtown, plus you have the Golden Gate Bridge in the foreground for your photos. If you see something, say something. Call 9-1-1 or talk to a police officer if you see something suspicious. Have a plan. It is easy to lose track of people during large events. It is even more difficult when there is an emergency. Designate a meet up spot if you get separated from your group. Be aware of your surroundings and take note of emergency exits. Have a designated driver or alternative transportation plan if you plan on drinking alcohol. All fireworks, including “Safe and Sane”, are dangerous and illegal in San Francisco. We encourage everyone to choose safety and observe a public firework show. If you have a noise complaint, call the police non-emergency line at (415) 553-0123.